This post, Gluten Free Sausage Gravy, may contain affiliate links. This means if you make a purchase through one of these links, Penguins in Pink will receive a commission at no additional cost to you. 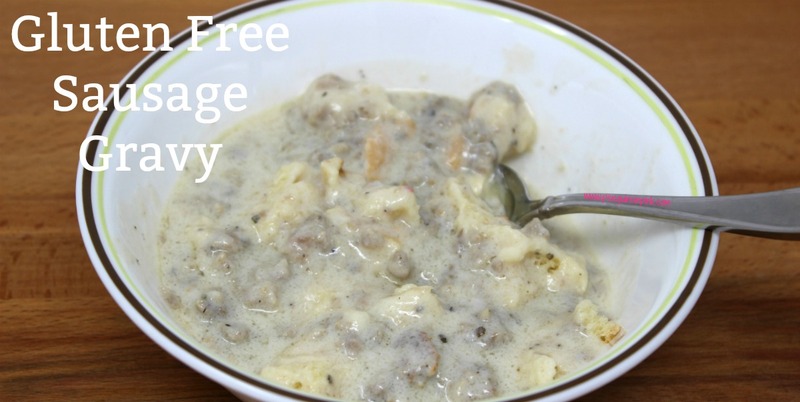 A simple and mouthwatering recipe for gluten free sausage gravy. If you are looking for comfort food then this is the recipe you need. 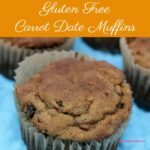 Perfect for weekend brunches, holiday breakfasts, or any time you want some delicious comfort food. My mom makes the best sausage gravy. 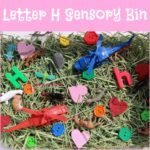 It is just AWESOME! Funny thing is growing up, I hated sausage and would only eat it in this gravy or her gluten free sausage and rice casserole (which is also awesome). 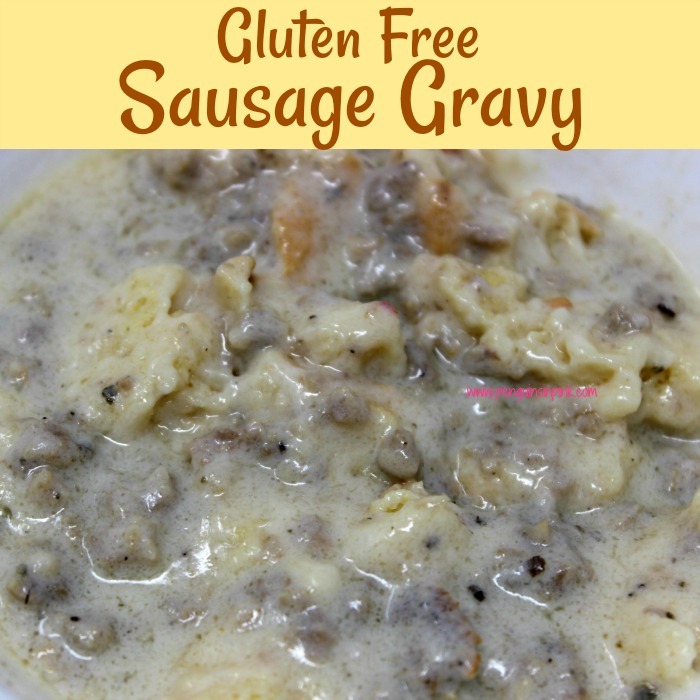 Gluten Free sausage gravy is not a dish you will make every weekend, but it is perfect for special occasions like Christmas morning, Easter morning, birthday breakfasts, or because your hubby wants it. While this dish is simple you do have to pay attention. Nothing ruins breakfast like burnt gravy! The version below is what my mom and I came up with for gluten free sausage gravy. Break up sausage and place in a skillet. Brown sausage until no longer pink. Sprinkle sausage 1/3 cup of flour scraping up any brown bits from the bottom of the pan. Pour milk over sausage and stir. Allow to boil and then reduce heat and simmer until thickened. Adding more milk if the gravy is too thick. Gluten Free sausage gravy is comfort food at it’s finest. Do you have a favorite comfort food from your childhood? 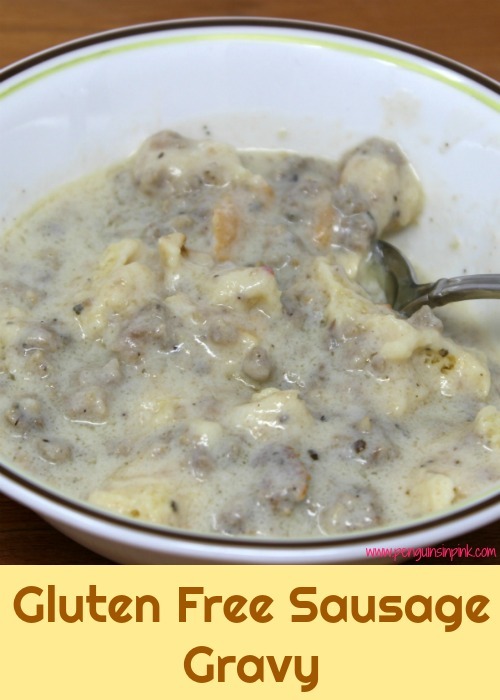 A simple and mouthwatering recipe for gluten free sausage gravy. If you are looking for comfort food then this is the recipe you need. Perfect for weekend brunches, holiday breakfasts, or any time you want some delicious comfort food. Serve over gluten free biscuits. Looking for more breakfast ideas? Check out my Recipes: Breakfasts board on Pinterest.